The last few weeks have been typical days of weather-wise March madness that has extended into April. Consequently I’m hearing thunder as I post this, and the skies have been gray all day–and yesterday–and the day before that most of the time. I was looking forward to taking you along with us virtually to Goa and sunshiny beaches, but since I’m chronicling our trip for the family with the India posts, I didn’t want to leave out the last day or so of Delhi. There are so many beautiful buildings in Delhi in addition to the old monuments, I decided I would do this short post on a couple of these buildings. We’re on our way to India’s Parliament and government complex (that looks somewhat like the mall area in Washington, D.C.), and the mansion where the President lives. 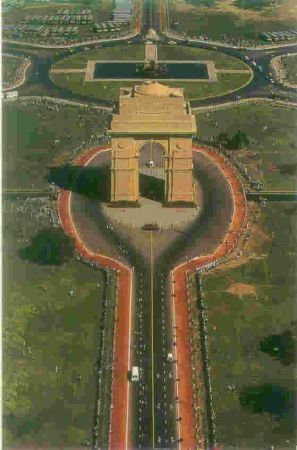 The India Gate monument you see here in the middle of the picture is a prominent landmark in New Delhi. It commemorates the 90,000 soldiers of the British Indian Army who lost their lives fighting for the British Raj in World War I and the Third Anglo-Afghan War. It is composed of red sand stone and granite. 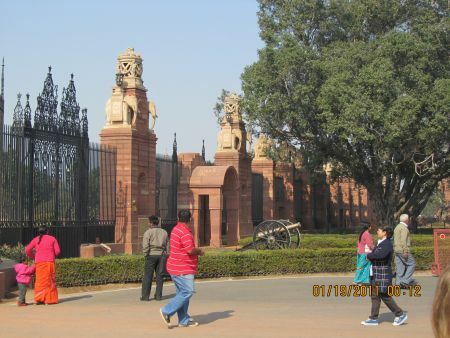 The President’s House and the Indian Parliament Administrative Buildings lie at the other end of this long driveway. Did you know that India’s president is a woman? When I expressed surprise at that fact, Hubby’s only response was India’s advanced that way! The President’s name is Srimati Pratibha Devisingh Patil, and she’s lived in the President’s House since taking office in 2007. Here we stop for a few minutes at the gateway to her home so I can get some pictures. Notice the stone elephants guards on either side. I wouldn’t mind having elephants posted at the entry to my house, too, but I suspect the neighbors might. The problem at being on this side of the gate presented problems in getting a nice shot to show you. So I cautiously put the camera’s safety strap around my wrist and hoisted my hand through the bars and came up with this picture. 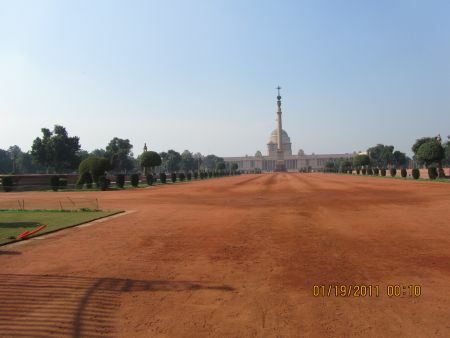 I suspect the roads are always kept manicured and clean like you see in these pictures, it being the compound that houses the president’s Home as well as the Parliament house, but there was another incentive for tidiness that day as well! History notes that India declared independence from British rule on January 26, 1930, so Congress then decreed that it would celebrate its independence with its Republic Day on January 26 of each year from then on. Meanwhile they continued to fight for complete self rule. That finally happened in August 15, 1947 when it became a sovereign nation. The day we visited (Jan. 20, not the 19th) the government was getting ready to celebrate their 62nd Republic Day six days later, on January 26. These are a few administrative buildings near the House of Parliament. So it’s still gray and now a fine sleet/rain/snow is falling. It’s just the kind of weather you don’t mind sacrificing the lecture you’d planned on attending if the weather doesn’t let up soon! Another cozy night in front of the television. Tomorrow I’m planning to come back and and, hopefully, do another post to counter this otherwise yukky day and similarly yukky post. Shopping is a good mood-enhancer, so whatever the weather decides to do to us, we’ll go last minute shopping in Delhi with Anna and her husband, Babloo. You’ll like Anna. If Anna can’t find whatever it is you’re looking for, and get the best bargain possible to boot , it doesn’t exist! I’m just glad it’s snowing there… and not here! Enjoyed my India visit this evening. Thanks! I was pretty smug watching you last weekend. This weekend is our turn I guess. Would you believe that just last week we had our studded tires changed back to regular?! Now we have to worry about the snow accumulating to the point that we might not make it back up the hill in the car! In April?! That just ain’t right! I love your descriptions of India. You have definitely changed my perspective about this beautiful country and the people. I would love to go there but know it won’t happen so this cyber visit is especially fun and interesting and pretty easy on the pocketbook and feet. I would have never thought their president would be a woman … how neat! So many things I didn’t know about India. Thank you. You can learn something new every day about just about anything! I’m enjoying re-learning myself. I’ve got G admitting that he would go back again to see the country as an adult. This is a big thing on his part. The gardens, hey? That’ll be coming up when we get to Mumbai! As for G, I can understand his reluctance in many ways. You just have to look for the good and not too hard at the bad. A little late, but I am still tagging along on your tour! There is so much to see and learn about. What? Sounds like me; always the last to get there because I’m taking too many photographs along the way! Nice to have you along no matter when you get there. I’ve been so busy, but…..I think I can finally begin reading all of your posts on India! Yes, I’ve saved every one. The Pres. home is quite impressive and hubby is right…..they are quite advanced to have a woman President! Nice to see you back, Terri! You lucky duck there in Cedar Key Florida! !